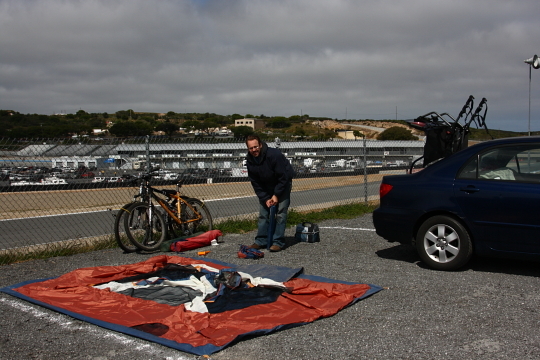 I am currently blogging to you on location from the Sea Otter Classic at Laguna Seca Raceway in Monterey. We arrived around 10 AM and have already been to our camp site and set up our tent. You heard that right we are camping here at the race track. Actually our campsite overlooks the race track. We are excited to let you know that we are working with Amateur Endurance for this event. We will be here for the next four days to cover a few of the races, the expo and everything in between. We expect to get really great shots because we were lucky enough to get media passes for all four days, a great perk to working with AE, that means access to spots that spectators don’t get. Keep checking back here for updates and also Amateur Endurance will be posting our race reports and general event coverage.